Habon di EM ta trahá di zeta i vètnan natural di kalidat haltu. E ta tratá ku soda káustiko i despues a añadí EM den e proseso di enfriamentu. No tin ningun aditivo sintétiko añadí manera, perfume, kloro i hidratante. Habon di EM ta 99% habon puru i no ta hasi daño na naturalesa ni medio- ambiente. Diferente hende ku problema di psoriasis i eksema a trese na nos atenshon ku nan tin bon eksperensha ku uso di habon di EM. Frega e habon ku awa den bo mannan te ora e skuma. Hunta e skuma riba e partinan di kurpa ku ke limpia i hawa ku sufisiente awa. An all natural EM-based soap that is ideal for sensitive skin. Safe, organic, and probiotic cleansing that naturally deodorizes. Long lasting and contains no chemicals, alcohol, or fragrances added. In todays marketplace it is difficult to purchase 100% pure soap. Most body cleansers are actually synthetic detergents. These detergents are labeled and marketed as “soap” but are not soap according to the legal definition of the product. 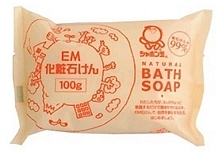 EM Soap on the other hand is made solely with natural oil. It is pure soap, NOT synthetic detergent. It is a chemical free product, so it is very safe to use on a daily basis. It is gentle on skin and is recommended for babies, the elderly and young women. EM Soap, through it’s unique combination of natural and pure ingredients, will keep your skin looking radiant, supple and healthy looking.